Synectic (Electronics)Design has been designing and manufacturing industrial and scientific instruments in the UK since 1990. Energy management devices have been a strong part of our offering for over a decade with small cost effective metering solutions being incorporated into building management systems for Blue chip companies, numerous universities as well as several Royal Palaces and the home of the UK’s prime minister 10 Downing Street. In 2013 a new phase was entered into when demand side response became a viable solution to supporting the UK National grid. 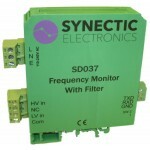 Synectic’s SD037 frequency monitor is at the heart of several of the Ngrids approved aggregators systems. Developed in conjunction with the aggregators the Synectic product range enables high speed, high accuracy, frequency monitoring even with high levels of harmonic noise. It is designed to monitor the frequency of a mains voltage signal and report the value, on demand, via an RS232 serial interface. Our clients control systems activate the electricity generating assets of big energy users like Sainsbury’s and Tarmac. The aggregators are able to switch power from solar, wind, ground source heat pumps and Bio gas energy generators and industrial storage batteries to the grid at times of peak demand. Synectic gives them reliable fast measurement we help them to keep the lights. It features a 3 pole low pass Bessel filter with a -3dB frequency of 75Hz. This removes unwanted harmonics from the input signal.